January 22, 2012 - On Friday the European Aviation Safety Agency issued an airworthiness directive (AD) on the Airbus A380. The European Aviation Safety Agency is requiring owners and operators of Airbus A380 superjumbo jets after perform a detailed visual inspection of the wing rib feet" the metal brackets that connect the wing's ribs to its skin after Airbus found new cracks in the metal brackets inside the wings. The Airbus A380 is a double-deck, wide-body, four-engine jet airliner manufactured by the European corporation Airbus. It is the world's largest passenger airliner. Many airports had to modify and improve their facilities to accommodate it. Designed to challenge Boeing's monopoly in the large-aircraft market, the A380 entered initial commercial service in October 2007 with Singapore Airlines. An airworthiness directive (commonly abbreviated as AD) is a notification to owners and operators of certified aircraft that a known safety deficiency with a particular model of aircraft, engine, avionics or other system exists and must be corrected. If a certified aircraft has outstanding airworthiness directives that have not been complied with, the aircraft is not considered airworthy. Thus, it is mandatory for an aircraft operator to comply with an AD. Further to this finding, inspections were carried out on a number of other airplanes where further cracks have been found. During one of those inspections, a new form of rib foot cracking originating from the forward and aft edges of the vertical web of the rib feet has been identified (Type 2 cracks according to Airbus AOT terminology). The new form of cracking is more significant than the original rib foot hole cracking. It has been determined that the Type 2 cracks may develop on other airplanes after a period of time in service. This condition, if not detected and corrected, could potentially affect the structural integrity of the aircraft. For this reason the European Aviation Safety Agency has issued this AD and requires a Detailed Visual Inspection (DVI) of certain wing rib feet. This AD also requires reporting the inspection results to Airbus. As of January 2012 there had been 253 firm orders for the A380, of which 68 have been delivered. 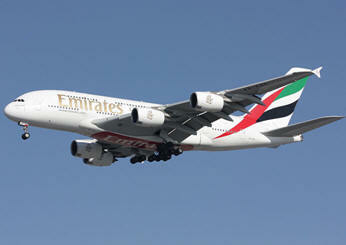 The largest order, for 90 aircraft, was from Emirates. At present there are sixty eight A380?s in flight operations. The A380's has a list price of $389.9 million. The aircraft has an upper deck extends along the entire length of the fuselage, with a width equivalent to a wide-body aircraft. This allows for an A380-800's cabin with 5,145.1 sq ft of floor space; 49% more floor space than the current next-largest airliner, the Boeing 747-400 with 3,455.2 sq ft, and provides seating for 525 people in a typical three-class configuration or up to 853 people in all-economy class configurations. The A380-800 has a design range of 9,600 mi, sufficient to fly from New York to Hong Kong at a cruising speed of Mach 0.85 or 560 mph at cruising altitude.